Who can deny the polished and sleek looks of glass garage doors? They are the epitome of high-aesthetics and elegance. By nature, glass maximizes space and becomes the focal point without stripping function and practicality. All the same, installing a glass garage door is not just a step closer to a more beautiful property but a way to save money in the long run and discover new paths of living. Here we are going to unveil why glass garage doors are more than just good looks. 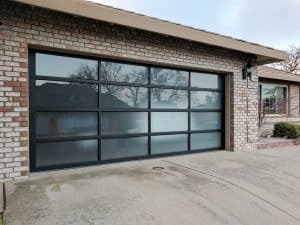 Offered in a great range of clear, laminated, and sand blasted options, glass garage doors can meet the aesthetic requirements of each modern property & address any fear about the security. You don’t need to choose clear glass but between many obscure glass panels to enhance security. Another concern is that they are not the best match to traditional homes, Victorian styles, or Georgian architecture designs but are the perfect solution for contemporary houses. They are attractive and versatile and they don’t need additional decorative elements to transform the exterior. They make a statement on their own. And their advantage is not limited to their good looks. It’s no secret that the main advantage of glass doors is the natural light. With the garage shed in natural light all day long, you don’t only save money but are given numerous garage transformation possibilities too. In case you decide to turn the garage into a living space, gym, office, or a place for family activities, you will have more light than you would ever had inside the house and a more pleasant environment. But even if you keep the garage a garage, it won’t be gloomy and dark. Since you don’t have to turn on the light during the day, you save on electricity costs. But it’s not only that. You can also have your glass door insulated and thus benefit from the advantage of energy efficient doors. The all-glass look is not reserved just for the home garage. 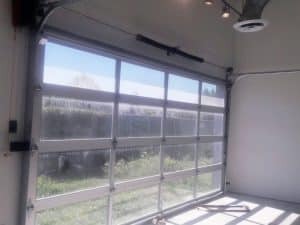 Nowadays, these garage door styles serve well in commercial properties where having lots of light or displaying goods is essential. Businesses in need of high-lift systems can take advantage of the clear vision of glass doors for brighter interiors while restaurants and cafes expand space and offer a clear view to their clients. In the home, the glass garage door advantage has been rediscovered in the form of moving walls and room dividers. At first glance, they seem delicate. But they are more than meets the eye. Most garage doors are made of double tempered glass panels and often incorporate a vinyl layer between them. This durable glass is scratch free and withstands high pressures while some products are made in accordance with wind-load standards. Glass doors usually come with an aluminum frame, which is lightweight and extremely durable and rust resistant. Since the glass sectional garage doors can open entirely, they make space expansive and thus open up the activity horizons too. The fact that they are easy to maintain and high-end garage door choices boost the value of your home tremendously. So, here you have it. There might be some small drawbacks which need to be considered but the advantages outnumber the disadvantages by far. Glass garage doors are not just a pretty face but an option with many potentials and benefits.